Cut bullets with your sword in a gun filled pit. 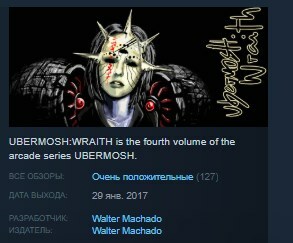 The the fourth volume of the series blends the projectile cutting from the original UBERMOSH, the psionic power Brainclap from UBERMOSH:BLACK, the swarm and endless map from UBERMOSH Vol.3, the new power Manastrike, a new class of enemy, more agressive enemy respawns, more achievements, various class mods and more music to pump the combat. From rookie to a godlike entity, UBERMOSH:WRAITH boost up the initial concept of "90 seconds arena" and invites you to react faster to beat your previous scores.